Goldendoodles are part of a growing group of dogs sometimes called designer dogs. It means your goldendoodle puppy was bred from a golden retriever and a poodle with the hopes of producing a dog with the best traits from both breeds. Goldendoodles are intelligent, easily trained and family-friendly. First generation goldendoodles with purebred golden retriever and poodle parents are generally healthy and can live up to 15 years if properly cared for. Puppy proof your house as soon as possible after bringing your goldendoodle puppy home if you can't do it beforehand. Goldendoodle puppies are curious and energetic. They explore with their mouths and like to play with whatever they can grab in their teeth. Small objects are choking hazards and electrical cords may electrocute your puppy if it chews on them. Keep these things hidden and out of reach. Poisonous plants and chemicals should be removed from your house and yard or kept out of reach of your goldendoodle. Fix your fence so your puppy can't escape. Provide your goldendoodle with a bed, dishes, toys and chew treats. You may also choose to crate train your goldendoodle, and will need a crate that is big enough for a fully grown, up to 80-pound goldendoodle to stand up in. Purchase puppy food for your goldendoodle. These high-energy pups need extra protein to grow and develop into healthy adults. Puppy formula foods provide this protein. Your goldendoodle should eat puppy food for at least a year before transitioning to adult formulas. Feed your goldendoodle puppy at least two times each day, once in the morning and once at night. Puppies with an active lifestyle may need to eat more often. Check the package for recommended daily feeding amounts, and talk to your veterinarian about adjusting your puppy's meals if it appears to gain too much or too little weight. Brush your goldendoodle puppy at least once a week. Goldendoodles have thick, sometimes curly coats that tangle or trap sticks, burs, dirt or grass. Brushing once a week will keep the coat from matting. It will also remove loose fur and reduce shedding. Bathe your goldendoodle as needed, when it looks or feels greasy and dirty. Grooming your goldendoodle regularly can help you detect developing health issues such as lumps or sores. Train your puppy as early as you can. Goldendoodles are an intelligent breed and learn quickly, so you can start training while your dog is still a puppy. Start making and enforcing rules for your puppy the moment its paws hit the floor. Enter it in puppy obedience classes, where it can get a head start on basic obedience and socialization. Practice commands daily at home by rewarding your goldendoodle for obeying your commands. Train your dog with the use of a collar and leash. Take your goldendoodle puppy for walks every day. Set aside time to play games, such as Frisbee or tug-of-war, together as well. Goldendoodles are energetic, even as adults, and need an outlet for their energy. Exercising with your goldendoodle will keep it healthy physically as well as mentally, and can help prevent it from developing behavior problems because of boredom. Aside from walking and playing, your goldendoodle might also enjoy jogging, swimming, hiking or even competitive sports such as agility or disc dog. Make your goldendoodle regular appointments to see a veterinarian. Puppies especially should have frequent checkups as they grow. 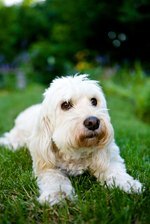 Goldendoodles are healthy dogs with few health concerns, but your puppy will need vaccinations and heartworm medication. Most puppies receive a series of vaccinations and booster shots within their first year of life.